Apple’s iPhone turns 10 this year, with the phone’s launch in 2007 heralding what would become one of the world’s most popular phones and instrumental to ushering in the smartphone era. The iPhone’s App Store is only matched by Android’s Google Play Store in its variety and ease of use, with thousands of different apps available to download. Apple has its fair share of exclusive apps, making it ideal if you’re looking to fill your phone up with fun, work tools and even things to help you during your day-to-day life. Navigating the App Store can be a daunting task, so here’s the pick of what’s available. The world’s most popular video-sharing site is an essential for all smartphones, whether you’re glued to your favourite channels or occasionally watch the odd viral video. As the app is no longer baked into iOS, you’ll have to download it from the App Store - something you should make a priority. As well as having thousands of video content at your fingertips, YouTube allows you to test your new iPhone, with high quality videos looking amazing on the Retina Display. WhatsApp has become the default communication app for millions of smartphone users, and it’s no different on iPhone. Regularly used more than standard text messaging or iMessage, WhatsApp has become popular thanks to its lightning-fast user experience as well as its ability to make chat groups with your friends and family. WhatsApp is free, meaning that the only charges involved is the data it uses when you’re not connected to WiFi. This online-based system means you don’t have to rely on phone signal to send messages. You can even make standard and video calls with WhatsApp, making it the de facto communication tool for iPhone. Another essential for keeping in touch with your friends is Facebook’s dedicated Messenger app. Whilst you might not want to have the Facebook app downloaded on iPhone (due to the amount of battery it uses), the Messenger app works independently, so you can use it without. Much like WhatsApp, Facebook Messenger works entirely using the web, meaning you won't have to pay anything apart from your data contract. Whilst it may seem pointless to have if you already have WhatsApp (like a billion other smartphone users), Facebook Messenger is ideal as a backup, as it allows friends to reach you via their computer, tablet or smartphone. Much like WhatsApp, you can also make video calls via the app as well as send IMs. If YouTube is the default video-streaming site, then Spotify is its equivalent for music. 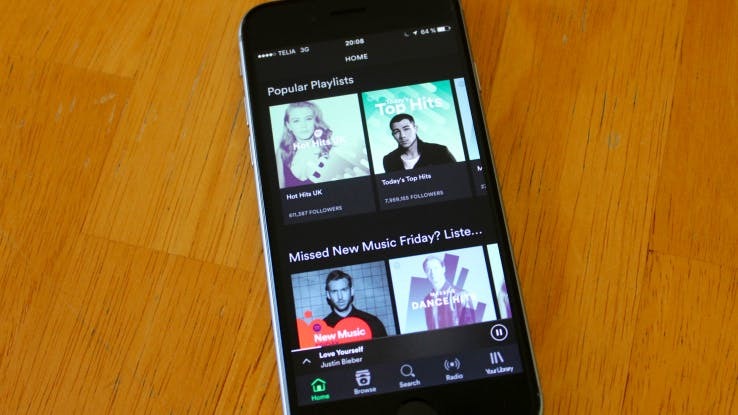 Used by millions of people worldwide, Spotify offers music from thousands of different artists to stream, with its library constantly updating to give you the latest music. No matter what music you’re into, Spotify is guaranteed to deliver. You can even use the app as a remote control for your computer or smart device. The app is free to download and use, but to listen without adverts you’ll have to pay a monthly subscription fee. Regardless of how much you listen, through, Spotify is a true essential on iPhone. As the iPhone runs on the iOS operating system, Google isn’t baked in like it is with Android devices. This means that the Google Search app is important for those who often search the internet on the go. With just a tap of the app, you’ll have access to Google Search, allowing you to continue onto Safari or whatever browser you choose to use. Whilst it might seem pointless to have Google Search when you can search on Safari, Google Search makes it far faster when you’re just looking to the answer to a question rather than full browsing. Google Search will also connect to your Google account, giving you notifications on traffic, sports coverage and more. Gaming giant Nintendo has an exclusive partnership with Apple to create games that come to the iPhone platform before Android. The first of these is Super Mario Run, a ‘runner’ style game that’s based on the world-famous gaming icon Super Mario. Super Mario Run has Mario run through a number of different themed levels. Unlike standard Mario games, the player has no control over him, only keeping the ability to jump over obstacles. This classic phone game formula is made all the better with Nintendo’s trademark polish and charm. Super Mario Run is free to download and try and unlike other free iPhone games, only requires one payment to keep playing, making it well-worth a download. One of the best things about mobile games is the innovation involved in making them. 80 Days shows this off perfectly. This interactive novel has you following the story of Around the World in 80 Days, playing as Phileas Fogg’s manservant Passepartout. The aim of the game is to get around the world in 80 days or less, with the player making narrative choices that impact the plot. 80 Days is a real showcase for what the iPhone has to offer in terms of gaming, proving that not everything you find on the App Store is a throwaway, microtransaction-filled puzzler. Based on the Hitman games that you can play on consoles and PC, Hitman GO takes the world of international assassin Agent 47 and squeezes it into a mobile puzzle game whilst still retaining the dark humour and chilly, European atmosphere of the standard games. The player must eliminate all the enemies on each course without being spotted, with extra points awarded for collecting items and doing it in less than a certain number of moves. 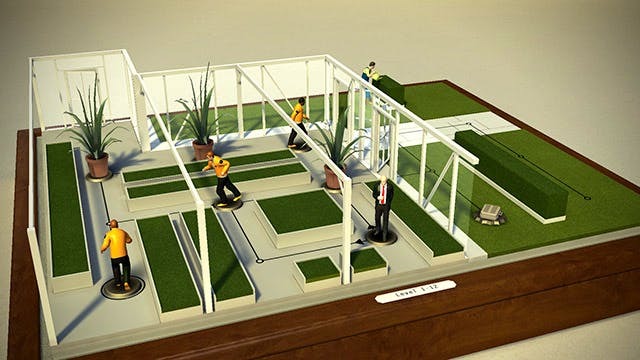 Hitman GO’s boardgame-style aesthetic makes it unlike anything else on the App Store, and is likely to please fans of the console games as well as those who’ve never played them. Another great example of the potential of mobile games, Her Story is the first game in years you might find yourself reaching to the pen and paper for. Playing Her Story involves watching a number of a police interviews with an unknown woman, and trying to figure out what’s happened to her. The game only allows you to watch small clips of the interview, meaning you’ll need to piece it together manually from the clues given in each clip. If you’ve always fancied yourself as a an amatuear sleuth, Her Story is a gripping and mysterious experience, unlike anything else on iPhone. For a game that’s just pure fun with a hint of 80’s retro aesthetic, Downwell is ideal. The game involves you navigating down a well as you’re falling, avoiding enemies and collecting gems as you go. Downwell is unique thanks to its ZX Spectrum-style visuals and surprisingly addictive gameplay. Plus, with just a small payment, it’s not the sort of game that you’ll need to keep pumping money into to continue playing. One of the most popular fitness apps on iPhone, 7 Minute Workout gives you an easy and quick exercise regime that you can do in your living room. Whether you’re looking to lose weight, get stronger or just keep healthy, 7 Minute Workout provides you with everything you need, with exercises that you can do anywhere. 7 Minute Workout is based on high intensity circuit training, that only needs a chair and wall to do. With 12 exercises done for 30 seconds, 7 Minute Workout is perfect for those who want to keep fit but don’t have a lot of time to spend at the gym. It also features Apple Watch support, meaning you can keep track of your workout without looking at your phone. Whilst it might seem like an obvious download, Microsoft Word on iPhone is a word processor that’s underrated when it comes to apps. Whilst many don’t realise that you can download Word (and other Microsoft Office apps) on iPhone, Word is an ideal word processor that has all the functions of the computer version that you’re familiar with. The Word app ideal to use in conjunction with the desktop counterpart, allowing you to work on files on the go using your phone and continue your progress when you get to your computer. This free app makes a perfect supplement to your working life, giving you more writing options on the go rather than being forced to use Apple’s Pages app. We all like doing a bit of shopping, and with iPhone, you can browse and buy on the go. The Amazon app is an essential for anyone who does a lot of their shopping online, with the app being a seamless experience for anyone who’s used to browsing Amazon via a computer. The Amazon app offers an uncompromised browsing experience, allowing users to search for anything available on Amazon and buy using their sign-in details. This is ideal for buying things in a pinch when you can’t get to a computer or just compiling a wishlist on the go. An essential for the modern shopper. For a simple way to organise your life through your iPhone, Evernote is the perfect app. Evernote allows you to collect all your notes, reminders, checklists and to-dos all into one app, making it easier to stay organised in both your work and personal life. 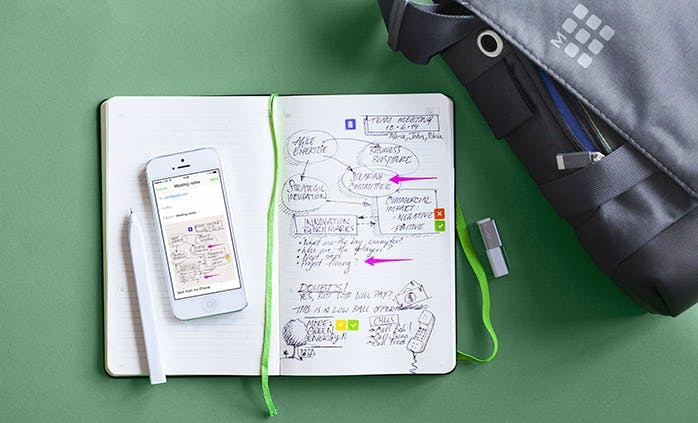 Evernote allows you to take photos of notes to scan them into the app and features sync technology, meaning you can keep all your info between the iPhone, iPad and computer versions of the app. You can also embed Microsoft Word docs and PDFs into Evernote, making it ideal for work on the go. Whilst it’s easy enough to find your way around via Apple Maps or Google Maps, finding somewhere to eat can be a daunting task. Yelp helps you by collating all the local restaurants, inns, bars, pubs and cafes in your area and giving you an overview of what’s available. Yelp allows its users to leave reviews and ratings for places they visit, allowing you to get a clear picture of the best places to go for breakfast, lunch or dinner. Yelp has over 100 million reviews for businesses worldwide, making it the ultimate app for finding where to go in a new city. If you’re looking for delivery, Yelp will also help you discover which places deliver and giving you their details. Whether you’re a seasoned photographer or just like taking the odd snap on your iPhone, the Camera + app gives you more options when it comes to photos. Camera + enhances your camera to give you a wealth of options that aren’t standard to the iPhone’s camera. These include front flash - allowing you to take selfies and group photos with added light, digital zoom, which gives you up to 6x zoom with advanced digital processing and effects that let you edit your photos after you’ve taken them. The Kindle app for iPhone is a great tool for both those who own a Kindle device and those who just want to read on the go. The Kindle app lets you access all your e-books straight from your iPhone, where you can also sync with your Kindle device to pick up from where you left off when reading. You’ll also be able to purchase e-books from the Amazon store which you can then download to your Kindle or read on your iPhone. Non-Kindle users can also enjoy reading on the Kindle app. Simply sign in with your Amazon account, download an e-book file and away you go. Netflix is by far the most popular streaming service available, with subscribers able to watch on their iPhone via the Netflix app. 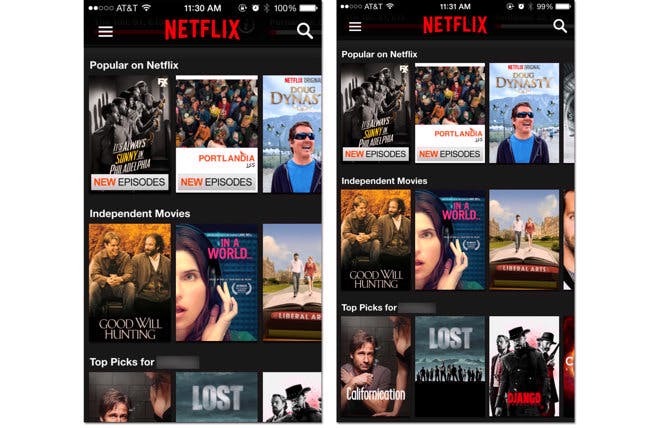 The Netflix app features everything you love about the service but on the smaller screen of your iPhone. Users can sign into their account, access their watchlist and continue watching content from where you left off watching on your computer or smart TV. The Netflix app is especially good if you own the latest iPhone 7 Plus. It’s larger, phablet-style screen means that your films and TV shows will look clear and crisp with a HD resolution. Following your favourite sports teams is easy with Team Stream. This app from sports website Bleacher Report collects news and info on all your favourite sports teams, from all sports imaginable. Want to follow Bath Rugby, Everton, Dallas Cowboys and Pittsburgh Penguins all in one place? Team Stream makes it possible. Team Stream also uses notifications to let you know about scores and news on the go. Unlike other sports apps, Team Stream makes it easy to follow your favourite teams without having to look through the app for news and updates. A must for film buffs, IMDB’s (Internet Movie Database) iPhone app successfully takes the vast library of film knowledge on the website version and transfers it to iPhone. IMDB allows you to explore any film or TV show imaginable, with casting lists, directors and individual actors available to view. Users can also rate and review movies using the app as well as make a watchlist of films they’d like to watch in the future. IMDB also allows you to watch trailers and see showtimes for upcoming movies. IMDB is an ideal app for looking up that small piece of movie trivia without having to use Google and is a great tool for fans of film.